Researchers from Israel and China working at the Technion-Israel Institute of Technology have developed a quick and simple to administer test that examines compounds in human breath helping them distinguish between gastric cancer, ulcers, and other common stomach ailments with 90% accuracy. Stomach cancer is currently diagnosed using an invasive biopsy model, where a probe with a small camera is inserted through the mouth and down the throat to examine the stomach lining. New test looks for chemical profiles in exhaled breath that are unique to patients with stomach cancer. Cancer appears to give off a signature smell of volatile organic compounds that can be detected using the right technical kit. Although not detectable by the human nose, dogs have been used successfully to pick out lung cancer patients in the past. In this study, 37 of the patients had stomach cancer, 32 had stomach ulcers and 61 had other stomach complaints. As well as accurately distinguishing between these conditions 90% of the time, the breath test could tell the difference between early and late-stage stomach cancers. Kate Law, director of clinical research at Cancer Research UK, said: "The results of this latest study are promising.....Only one in five people are able to have surgery as part of their treatment as most stomach cancers are diagnosed at stages that are too advanced for surgery. Any test that could help diagnose stomach cancers earlier would make a difference to patients' long-term survival." 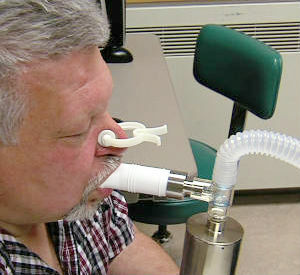 Other breath tests, including one for lung cancer, are currently under development.